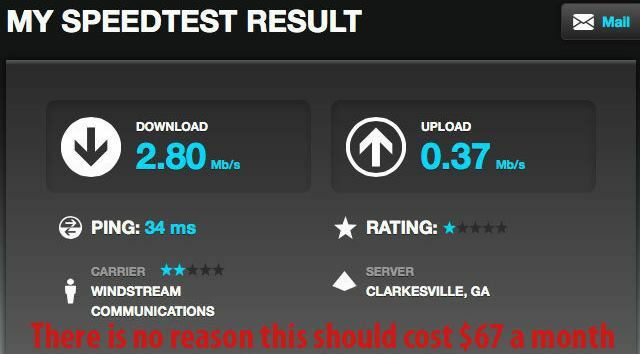 broadband speeds Archives · Stop the Cap! A corporate-funded business advocacy group backed by the telecom industry and the Koch Brothers is pursuing a lawsuit asking the D.C. Court of Appeals to toss pro-consumer deal conditions imposed by the Federal Communications Commission in return for granting its 2016 approval of the acquisition of Time Warner Cable and Bright House Networks by Charter Communications. The Competitive Enterprise Institute filed an initial petition with the FCC asking the agency to rescind its own deal conditions shortly after the merger was completed. CEI argued the agency imposed “harmful merger conditions on Charter that had nothing to do with the merger itself,” and that the FCC did not have the authority to put corporate merger deal conditions in place. CEI specifically targeted its objections to the FCC’s seven-year ban on Charter Spectrum data caps and consumption billing, arguing the ban raised broadband pricing for all Spectrum customers and prevented the cable company from offering discounts to low usage customers. It also claimed that Charter had to increase pricing for all customers because the FCC required Spectrum to raise broadband speeds, introduce a discounted internet program for low-income customers, and expand service to at least two million new households not presently served by Spectrum. This week, it filed an opening brief appealing the FCC’s decision to the D.C. Court of Appeals, which oversees the legality of the FCC’s regulatory decisions. The 101-page filing maintains the FCC overreached by imposing any deal conditions on the 2016 multi-billion dollar merger deal, especially those that might require the merged company to spend money to improve service to customers. CEI argued such conditions were “arbitrary and capricious” and had no place as part of approving a business merger transaction. The group submitted evidence from four individuals who attested to their belief that the deal conditions “probably contributed” to price increases after customers abandoned their legacy Bright House and Time Warner Cable plans in favor of Spectrum plans and pricing. 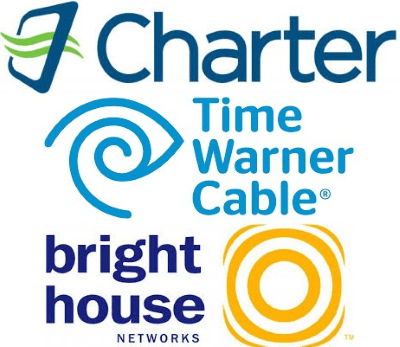 The customers reported rate hikes ranging from $4 a month to $20 a month “for the same services,” but did not attach copies of their bills allowing a court to ascertain whether those rate increases involved cable television or broadband service or both. No evidence was provided to prove CEI’s assertion that rate increases were directly tied to merger conditions other than a declaration from Robert W. Crandall, an economist and nonresident senior fellow at the Technology Policy Institute in Washington, D.C. Crandall argued any deal conditions requiring a cable company to spend money to expand, improve, or discount services would likely impact subscriber rates. No disclosure was made regarding any fees paid to Crandall to conduct research on behalf of CEI. The Technology Policy Institute is financially backed almost entirely by the Koch Brothers and corporate interests including AT&T, Charter Communications, Comcast, and Verizon. CEI’s legal brief depends on assertions made by then-minority Republican members of the FCC, notably then-Commissioners Ajit Pai and Michael O’Rielly, who objected to the FCC’s merger conditions. CEI ignored the views of the then-Democratic majority on the Commission, who voted to approve the merger with deal conditions. Then Chairman Thomas Wheeler and Commissioners Mignon Clyburn and Jessica Rosenworcel were not mentioned anywhere in CEI’s brief. Today the Commission has a Republican majority, with Pai now serving as chairman. CEI’s argument follows a similar pattern to arguments made against net neutrality — namely, the FCC has no authority to regulate broadband services or the pricing and policies of the companies providing it. Charter Communications has occasionally argued the same point with the New York State Public Service Commission, which imposed deal conditions of its own in return for approval of the merger. Charter has consistently reserved the right to object to deal conditions requiring it to build out service to rural areas, as well as any deal conditions that go beyond the authority of state regulators to oversee broadband service. In Charter’s view, state regulators have no such authority. In the state’s view, the PSC has the right to consider a myriad of factors because its regulatory mandate requires approving or rejecting a merger based on the public interest. Its 2016 merger order found the transaction was not in the public interest unless the parties agreed to certain deal conditions, which closely resembled those required by the FCC. When Charter allegedly failed to meet the conditions it agreed to, the New York regulator could not directly compel Charter Spectrum into compliance, but it could and did decertify the merger itself. Should the D.C. Court of Appeals find in favor of CEI, the deal conditions imposed by the FCC would be revoked, although Charter could continue to honor those conditions voluntarily. Separate legal cases would have to be brought in state courts to invalidate deal conditions imposed by state regulators. By the year 2022, 60% of the world’s population will be connected to the internet and 82% of online traffic will come from streaming video. Those are the conclusions found in Cisco’s newest Visual Networking Index (VNI), based on independent analyst forecasts and real-world network usage data tracked by the networking equipment manufacturer. By 2022, the busiest hour of internet traffic will be six times more active than the average. Busy hour internet traffic will grow by nearly five times (37 percent CAGR) from 2017 to 2022, reaching 7.2 petabytes1 per second by 2022. In comparison, average internet traffic will grow by nearly four times (30 percent CAGR) over the same period to reach 1 petabyte by 2022. Regionally, Asian-Pacific internet users are expected to use far more internet data than North Americans — 173 exabytes a month by 2022 vs. 108 exabytes in North America. Usage caps, usage-based pricing, and overall slower internet speeds in the U.S. and Canada have slowed growth in new high-bandwidth internet applications. The prevalence of low-speed DSL in rural areas also restricts potential traffic growth. Large parts of the Asia-Pacific region use very high-speed fiber to the home technology. The slowest growing regions — Latin America and the Middle East/Africa, which lag behind in internet penetration, often apply low usage caps or bandwidth restrictions and often do not have the ability to financially scale growth to meet demand. Even by 2022, Latin America will generate only 19 exabytes of traffic per month. An unhappy customer in Georgia. Victor Brown, like many residential customers in rural northeastern Ohio, has one option for internet access — Windstream, an independent phone company that typically serves areas larger companies like AT&T, Verizon, and CenturyLink forgot. For 17 years, his internet speed has been absolutely consistent, and slow. Windsteam has told its investors that it expects to offer 60% of its customers at least 25 Mbps service by the end of 2018. In fact, Brown has already been offered that for nearly a year, but the service is not actually available. Brown and several of his neighbors all attempted to upgrade to the higher-speed service advertised. Windstream accepted their orders, charged them more, and delivered exactly the same 1.2 Mbps service they have always had. Brown explained the Windstream technician candidly told him that the company’s head office is behind the speed upgrades, but does not actually have a clear understanding of the state of the local network. Marketing then sells customers on better service Windstream’s network is not capable of providing. 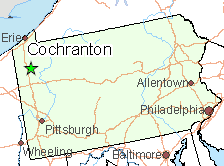 Ruth in Cochranton, Penn., is in exactly the same position. 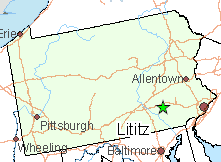 Over in Lilitz, Penn., Eileen and her neighbors were also dealing with temporary phone lines Windstream installed by dropping both on their lawns and then leaving them unburied for nine months. She cannot get anyone from the company to bury the lines despite seven separate phone calls. Down the street, internet and phone outages can last a week after a strong rainstorm hits the area, and since the weather has turned much colder, hum and crackle on the neighborhood’s phone lines have disrupted phone calls and DSL service. Nobody from Windstream has come to fix the problem. 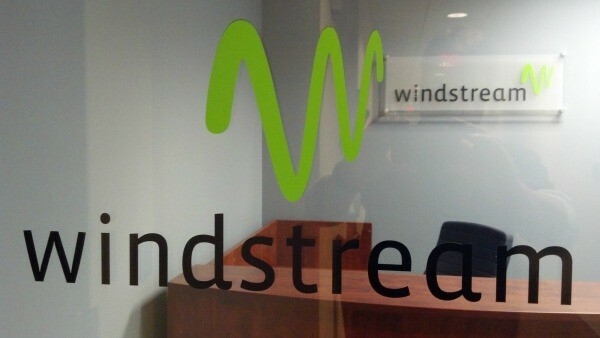 Windstream tells a very different story to its investors in the form of ‘upgrades by press release’ and cheerful investor conference calls that claim dramatic improvements in service and growth. While cable operators are touting increasing availability of gigabit service, phone companies like Windstream are promising to give a little more than half their customers the minimum definition of broadband service — 25/3 Mbps, by the end of this year. Many of Windstream’s other half get nothing close to those speeds, with 1-3 Mbps common in rural areas. Wall Street balks at the dollar amounts it would take for Windstream to fully update its network to offer broadband speeds that were common for cable subscribers a decade ago. That kind of network investment would likely drive down the share price, impact shareholder dividends or stock buyback plans, and increase debt. Instead, many phone companies are hoping the federal government will come to the rescue and subsidize rural network improvements through the FCC’s Connect America Fund or government grants. But many of those grants won’t deliver service improvements to existing customers. Instead it will allow rural phone companies to bring broadband to customers who never had it before. Even the threat of new competition has not inspired many investor-owned phone companies to embark on a spending spree. That competition may eventually come from new wireless broadband services like 5G, but most observers predict that will be years away in the rural communities Windstream traditionally serves. Where Windstream does face competition, it often still loses market share, usually to the local cable company. Brown believes it is time for the federal government to start insisting that investor-owned phone companies do better. 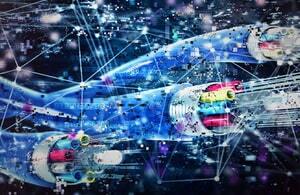 Cisco is helping cable operators get ready to finally end the wide speed disparity between upload and download speeds offered by most cable operators. As cable operators continue to upgrade their cable systems to support DOCSIS 3.1 technology that makes it much easier to offer gigabit broadband speeds, Cisco is introducing the industry’s first “Full Duplex-Ready” GS7000 FDXi neighborhood node. It is an intelligent, remotely programmable piece of equipment that divides up broadband service to a number of households in a neighborhood. But unlike previous models, this one can offer customers the same upload and download speeds. Since the earliest days of cable modem technology, most bandwidth has been reserved for downloading, giving customers only a fraction of available speed for uploading content. Cisco promises cable operators can provision its newest offering to deliver Full Duplex service in as little as two minutes. The equipment is expected to undergo field trials as early as this fall with sales widely expected to begin in early 2019. Comcast reports it is already testing its own new network configuration combining Distributed Access Architecture with Full Duplex. With remote surveillance cameras, video teleconferencing and virtual reality applications beginning to use significant amounts of upload bandwidth, cable operators expect an upswing in upstream traffic on their networks. Comcast’s Robert Howald told attendees at a pre-SCTE Cable-Tec Expo event that the cable operator “wants to go symmetrical,” which means offering customers the same upload and download speeds. To manage this, Comcast needs to eliminate a large percentage of copper coaxial cable from its network and replace it with fiber, something the company has gradually been doing over the past few years. Comcast may be positioned to bring Full Duplex online earlier than many other cable operators because of its ongoing effort to push fiber optics closer to its customers. Other cable operators, particularly smaller ones, may have a long way to go to be Full Duplex ready at high internet speeds. Some, like Altice’s Cablevision, have chosen to scrap traditional hybrid fiber-coax technology entirely, going all-fiber straight to the home. Other operators are hoping customers are not quite ready to demand identical upload and download speeds, and believe faster download speeds will satisfy customers for at least the next 5-10 years. If they are wrong, competitors offering fiber service could steal a lot of their business sooner than they think. 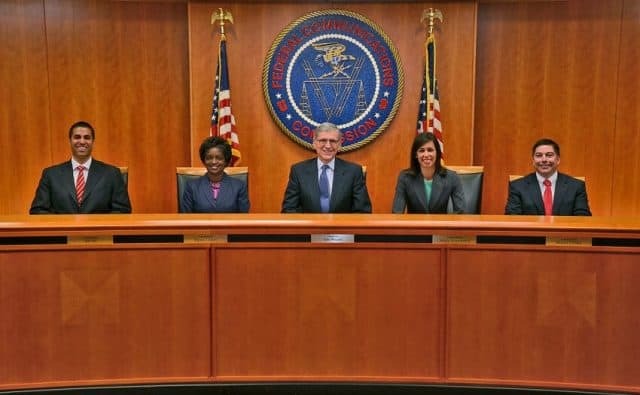 This week, the FCC announced bidding has finished for the latest Connect America Fund (CAF) broadband subsidies auction. Once again, the FCC gave first priority to incumbent phone companies to bid for the subsidies, which defray the cost of expanding internet access to homes and businesses otherwise unprofitable to serve. Nearly $2 billion was left on the table by disinterested phone companies after the first round of bidding was complete, so the FCC’s second round opened up the leftover money to other telecom companies. Winning bidders will receive their portion of $198 million annually in 120 monthly installments over the next ten years to build out rural networks. In return, providers must promise to deliver one broadband and voice service product at rates comparable to what urban residents pay for service. The winning bids, still to be publicly announced, will come from rural electric and phone cooperatives, satellite internet providers, fixed wireless companies, and possibly a handful of cable operators. But much of the money overall will be spent by independent phone companies rolling out slow, copper-based, DSL service. Because the total committed will take a decade to reach providers, rural Americans will likely face a long wait before what purports to be “broadband” actually reaches their homes and businesses. While many co-ops will spend the money to expand their own homegrown fiber-to-the-home services, most for-profit providers will rely on wireless or copper networks to deliver service. Overseas, broadband expansion is headed in another direction — expansion of fiber-to-the-home service, with little interest in investing significant sums on furthering old technology copper wire based DSL and fixed wireless services. The expansion is moving so quickly, Verizon made certain to sign long-term contracts with optical fiber suppliers like Corning in 2017 to guarantee they will not be affected by expected shortages in optical fiber some providers are already starting to experience. Virtually everywhere in developed countries (except the United States), fiber broadband is quickly crowding out other technologies, despite the significant cost of replacing copper networks with new optical fiber cables. If a provider is brave enough to discount investor demand for quick returns and staying away from big budget upgrade efforts, the rewards include happier customers and a clear path to increased revenue and business success. Not every Wall Street bank is reluctant to support fiber upgrades. Credit Suisse sees a need for optical fiber today, not tomorrow among incumbent phone and cable companies. “The cost of building fiber is less than the cost of not building fiber,” the bank advised its clients. The reason is protecting market share and revenue. Phone companies that refuse to upgrade or move at a snail’s pace to improve their broadband product (typically DSL offering 2-12 Mbps) have lost significant market share, and those losses are accelerating. Ditching copper also saves companies millions in maintenance and repair costs. Canada’s Telus is a case in point. Its CEO, Darren Entwistle, reports Telus’ effort to expand fiber optics across its western Canada service area is already paying off. Telus’ chief competitor is Shaw Communications, western Canada’s largest cable company. Fiber optics allows Telus to vastly expand internet speeds and reliability, an improvement over distance sensitive DSL. Shaw Cable has boosted its own broadband speeds and offers product bundles that have been largely responsible for Telus’ lost customers, until its fiber network was switched on. 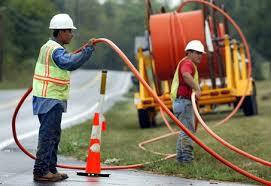 In economically challenged regions, fiber optic expansion is also growing, despite the cost. In Spain, Telefónica already provides service to 20 million Spaniards, roughly 70% of the country, and plans to continue reaching an additional two million homes and businesses a year until the country is completely wired with optical fiber. In Brazil, seven million customers will have access to fiber to the home service this year, expanding to ten million by 2020. Verizon and AT&T regularly ring alarm bells in Congress that China is outpacing the United States in 5G wireless development, but are strangely silent about China’s vast and fast expansion into fiber optic broadband that companies like Verizon stopped significantly expanding almost a decade ago. China already has 328 million homes and businesses wired for fiber and added another five million homes in the month of June alone. AT&T will take a year to bring the same number of its own customers to its fiber to the home network. The three countries that are most closely aligned with the mentality of most U.S. providers — the United Kingdom, Australia, and Germany — are changing their collective minds about past arguments that fiber to the home service is too costly and isn’t necessary. The government of Martin Turnbull’s cost concerns forced a modification of the ambitious proposal by the previous government to deploy fiber to the home service to most homes and businesses in the country. That decision to spend less is coming back to haunt the country after Anne Hurley, a former chief executive of the Communications Alliance involved in the National Broadband Network (NBN), admitted the cheaper NBN will face an expensive, large-scale replacement within a decade. Turnbull’s government advocated for less expensive fiber to the neighborhood technology that would still rely on a significant amount of copper wiring installed decades ago. The result, according to figures provided to a Senate committee, found only a quarter of Australians will be able to get 100 Mbps service from the NBN, with most getting top speeds between 25-50 Mbps. Despite claims of technical advancements in DSL technology which have claimed dramatic speed improvements, Hurley was unimpressed with performance tests in the field and declared large swaths of the remaining copper network will have to be ripped up and replaced with optical fiber in just 5-10 years. “If you look around the world other nations are not embracing fiber-to-the-[neighborhood] and copper … so yes, it’s all going to have to go and have to be replaced,” she said. In the United Kingdom, austerity measures from a Conservative government and a reluctant phone company proved ruinous to the government’s promise to deliver “superfast broadband” (at least 24 Mbps) over a fiber to the neighborhood network critics called inadequate from the moment it was switched on in 2012. The government had no interest in financing a fiber to the home network across the UK, and BT Openreach saw little upside from spending billions upgrading the nation’s phone lines it now was responsible for maintaining as a spun-off entity from BT. In 2015, BT Openreach’s chief technology officer called fiber to the home service in Britain “impossible” and too expensive. Two years later, while the rest of Europe was accelerating deployment of fiber to the home service, the government was embarrassed to report its broadband initiative was a flop in comparison, and broke a key promise made in 2012 that the UK would have the fastest broadband in Europe by 2015. Instead, the UK has dropped in global speed rankings, and is now in mediocre 35th place, behind the United States and over a dozen poorer members of the EU. What was “impossible” two years ago is now essential today. The latest government commitment is to promote optical fiber broadband using a mix of targeted direct funding, “incentives” for private companies to wire fiber without the government’s help, and a voucher program defraying costs for enterprising villages and communities that develop their own innovative broadband enhancements. The best the government is willing to promise is that by 2033 — 15 years from now — every home in the UK will have fiber broadband. 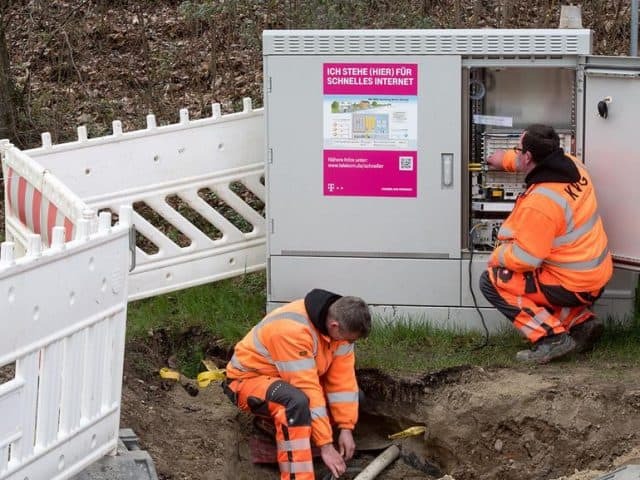 Deutsche Telekom echoed BT Openreach with claims it was impossible to deliver fiber optic broadband throughout an entire country. Deutsche Telekom’s dependence on broadband-enhancements-on-the-cheap — namely speed improvements by using vectoring and bonded DSL are increasingly unpopular for offering too little, too late in the country. Deutsche Telekom applauded itself for supplying more than 2.5 million new households with VDSL service in 2017, bringing the total number served by copper wire DSL in Germany to around 30 million. The company, which handles landline, broadband and wireless phone services, is slowly being dragged into fiber broadband expansion, but on a much smaller scale. In March, Telekom announced a fiber to the home project in north-east Germany’s Western Pomerania/Rügen district for 40,000 homes and businesses. The network will offer speeds up to 1 Gbps. In July, Telekom was back with another announcement it was building a fiber optic network for Stuttgart and five surrounding districts Böblingen, Esslingen, Göppingen, Ludwigsburg, and Rems-Murr, encompassing 179 cities and municipalities. But most of the work will focus on wiring business parks. Residents will have a 50% chance of getting fiber to the home service by 2025, with the rest by 2030. In contrast, the chances of getting fiber optic broadband in the U.S. is largely dependent on which provider(s) offer service. In the northeast, Verizon and Altice/Cablevision will go head to head competing with all-fiber networks. Customers serviced by AT&T also have a good chance of getting fiber to the home service… eventually, if they live in an urban or suburban community. Overbuilders and community broadband networks generally offer fiber service as an alternative to incumbent phone and cable companies, but many consumers don’t know about these under-advertised competitors. The chances for fiber optic service are much lower if you live in an area served by a legacy independent phone company like Frontier, Consolidated, Windstream, or CenturyLink. Their cable competitors face little pressure to rush upgrades to compete with companies that still sell DSL service offering speeds below 6 Mbps. CAF funding from the FCC offers some rural areas a practical path to upgrades with the help of public funding, but with limited funds, a significant amount will be spent on yesterday’s technology. In just a few short years, residents will be faced with a choice of costly upgrades or a dramatic increase in the number of underserved Americans stuck with inadequate broadband. Policymakers should not repeat the costly mistakes of the United Kingdom and Australia, which resulted in penny wise-pound foolish decisions that will cost taxpayers significant sums and further delay necessary upgrades for the 21st century digital economy. The time for fiber upgrades is now, not in the distant future.